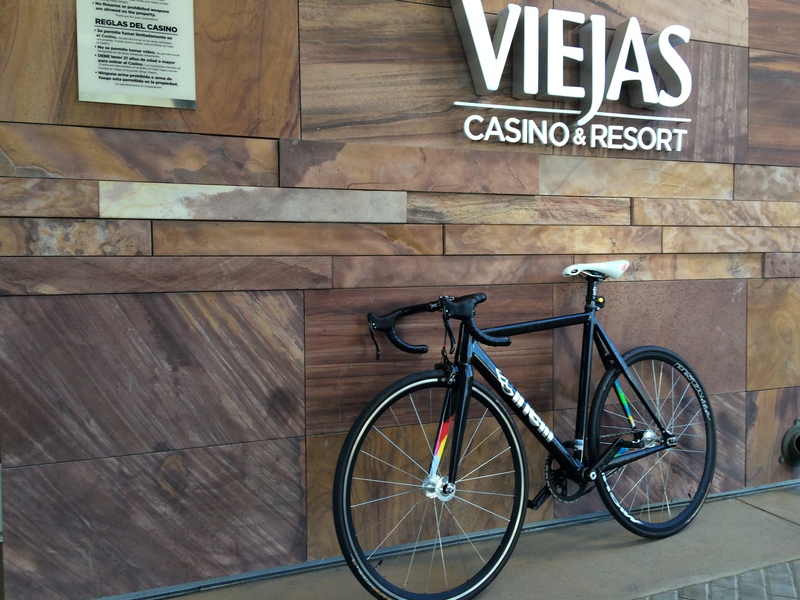 I rode out to Viejas Casino from again this morning. From downtown San Diego, it’s a 90 km trip with 1300 m of climbing, on a fixie, wearing jeans. All the parking lot and valet guys looked pretty surprised to see me arrive on a bike. Tribal land in California is always way out in the middle of nowhere, and a city bike is the last thing you’ll see out there. Strava says I burned 2650 calories. But it doesn’t know that I rode 48×16 fixed up those hills. It assumes you’ll do something reasonable like use gears. I made good time today, getting out to the casino in 2.5 hours. By car, it takes about 40 minutes each way, and at least 10 litres of gas. My body made the trip using only 1 litre of Coca Cola, two oranges, an energy bar, and a (comp’ed) burrito. It’s amazing how efficient the body is.